If you don’t receive the Passanante’s Home Food Service email updates you’re missing out on exciting announcements about new menu items, contests, and some incredibly simple recipes that you and your family would love! This recipe for Herb Roasted Chicken is one of our favorites because it only had a few simple ingredients and it’s ready in five easy steps. Such a great recipe to have on hand for those busy days! 2. Rub inside of chicken with lemon juice; sprinkle with salt and pepper. 3. Add the onion quarters, celery, dried herbs, and parsley to chicken cavity. 4. 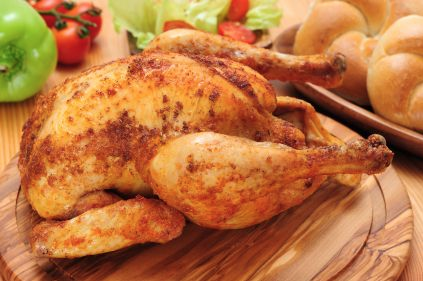 Place chicken in a shallow roasting pan and roast at 350° for about 20 minutes per pound. 5. Baste with melted butter several times. Internal temperature should register at least 165° on a meat thermometer inserted into the meaty part of the thigh. This entry was posted in Poultry, Recipes and tagged chicken, Facebook Contest, Free Food Sample, herb roasted chicken, Passanante's Home Food Service, Recipe, Win Big by Passanante's Home Food Service. Bookmark the permalink.